Moscow doctors have stabilized the medical condition of ice hockey forward Aleksandr Galimov – one of the two survivors of Wednesday’s plane crash near the city of Yaroslavl. Most of his team, top KHL squad Lokomotiv, perished is the crash. 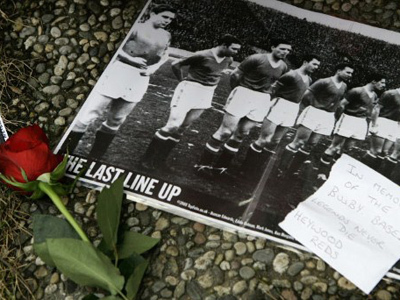 ­The player sustained burns to almost 90 per cent of his body, as well as his respiratory system. Despite his critical condition, the medical team in Yaroslavl managed to stabilize him, and on Thursday he was transported to The Vishnevsky Institute of Surgery of the Russian Academy of Medical Sciences – one of the country’s top medical facilities. The medical staff say they would avoid making prognoses, and yet they hope that the athlete’s strong organism will help them save his life. The main task for the moment, they say, is getting him out of the physiological shock. The doctors went on to explain that the third or fourth day from the moment of sustaining a burn is considered most critical. By this moment the toxicity usually reaches its peak, and this is when many people who have sustained burns die. According to media reports, Galimov’s father managed to talk to his son on Thursday. However, the medical staff point out that the player’s treatment plan requires rest. For this reason, the patient is currently staying in an induced coma and on artificial ventilation. Given the circumstances of the plane crash and his injuries, it now seems almost unbelievable that Aleksandr was making for the shore by himself. That is according to special police unit officers, Dmitry Konoplev and Oleg Smirnov, who witnessed the crash and were the first to arrive on the scene to help the survivors. The officers were patrolling the Volga River stretch on their speedboat near the airport when they saw the plane collide with a beacon mast and fall behind trees. It took them less than two minutes to arrive on the scene. Once there, they saw a man chest-deep in the water making for the shore – this was Aleksandr Galimov. The policemen attempted to come closer to the man and called him to get away from the debris of the plane. Shortly afterwards, emergency vehicles from the airport began to arrive. Despite the traffic and remoteness of the crash site from the Yaroslavl city center, it only took the emergency personnel 40 minutes to deliver both survivors to hospital. The other person who survived the crash is flight engineer Aleksandr Sizov. He is currently hospitalized in the Moscow Sklifosovsky Research Institute of First Aid. His medical condition is grave, but of less concern than that of Aleksandr Galimov. 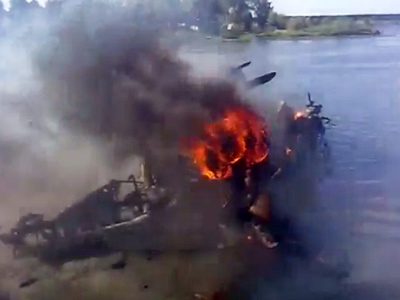 A chartered Yak-42 aircraft crashed Wednesday into a river near Yaroslavl airport shortly after takeoff. 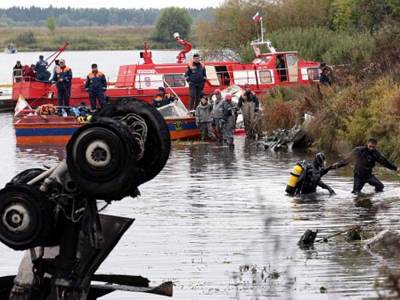 The incident claimed 43 lives, most of them players from the major league hockey team Lokomotiv. With the flight recorders having been recovered, the investigation into the cause of the crash is on its way. Meanwhile, the coach of the Slovakian national ice hockey team, Vladimir Vujtek, who used to train Lokomotiv, has arrived in Russia to pay tribute not only to the players, but also to those who worked with them. “I had known the staff of the team for ten years. We were close friends and had been since I got acquainted with them when I first came to Yaroslavl. The crash has struck me very hard. 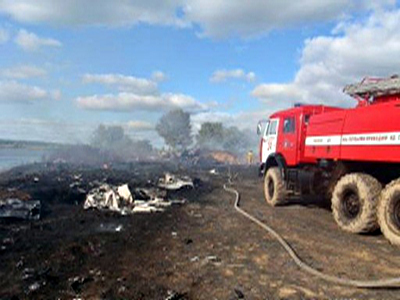 It’s a serious tragedy for me personally,” Vladimir Vujtek told RT. “Only six months ago I used to fly with almost all of them. Everyone was preparing for the upcoming season. They had serious goals in sight – they wanted to win the Gagarin Cup. And now to see how these hopes were dashed in a matter of minutes,” he added. Lokomotiv hockey team included many international players, from Belarus, Canada, the Czech Republic, Germany, Latvia, Slovakia and Sweden. On Thursday, mourning services were held both in those countries and their embassies in Russia.